Jean-Pierre Boulé is Professor of Contemporary French Studies at Nottingham Trent University and the author of a number of books, notably on Sartre, including Sartre médiatique (1992) and Sartre, Self-Formation and Masculinities (2005). He is the co-founder of the U.K. Sartre Society and executive editor of Sartre Studies International. His most recent books include Jean-Paul Sartre: Mind and Body, Word and Deed, co-edited with Benedict O’Donohoe (2011) and a companion volume to the present one, Existentialism and Contemporary Cinema: A Sartrean Perspective, co-edited with Enda McCaffrey (2011). Ursula Tidd is Senior Lecturer in French Studies at the University of Manchester. 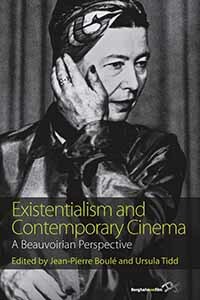 She is the author of three monographs: Simone de Beauvoir, Gender and Testimony (1999); Simone de Beauvoir, Routledge ‘Critical Thinkers’ series (2004) and Simone de Beauvoir Reaktion ‘Critical Lives’ series (2009) as well as articles and chapters on Beauvoir’s autobiographies, fiction, and philosophy. She is currently writing a monograph on the Francophone Spanish Holocaust writer Jorge Semprún (forthcoming with Legenda/MHRA 2013).